Though she grew up on a working cattle ranch, Jen Crane has been into fantasy and sci-fi since seeing a bootleg tape of The Princess Bride. She has a master's degree and solid work histories in government and non-profit administration. But just in the nick of time, Jen pronounced life too real for nonfiction. She now creates endearing characters and alternate realms filled with adventure, magic, and love. Jen is happily living out her dream in The South with her husband and three children, striking that delicate balance between inspiration and frustration. I devoured every word of Betrayal Foretold. Reading for three hours non stop. That was the perfect way to end the series. I am sad that it has ended though. Jen Crane is a master storyteller. The way she weaves her words together is truly magnificent. I will not spoil the story and tell you what happened because you need to experience the magic for yourself. I definitly enjoyed reading Descended of Dragons series. Its a romantic shifter book i just had to keep reading it had me hooked from the start to the very end. Firstly: I was a pretty big fan of books one and two, and while this one I'm only giving 3 stars, I still suggest you read it. My -2 on the stars is due to the fact that the story feels rushed or that the author got bored with it and really didnt want to put effort into it. There were so many opportunities for this book to flesh out some really awesome details but instead it remains very superficial and leaves a TON of questions. We start off with a prologue of Brandubh upset over the loss of his dragons, but satisfied because he has spies everywhere and has some kind of "ace up his sleeve". Sounds dark and exciting right? Oh what can he have in store for our favorite hybrid?? It turns out to be almost nothing, which I will expand on further down. Chapter One we are back with Stella, who is hiding out in the woods, a fugitive from both Brandubh and from the people and government of thayer. Dean Miles still has a vendetta against Stella and has released her journal entries to the entire population. How did she get such entries? Her Pia, who in books one and two is shown as being capable of interacting with their user, but not as being a complete AI with the ability to make decisions or think emotionally, decided to GIVE the Dean the files to "save" Stella. "Wwhen you revealed your origin, your relatives, and your encounters with the sorcerer, I was obligated to share that information with Radix Administration to protect not just the people of Thayer, but to protect you." In books one and two I felt like Pia was an advanced version of Siri, but certainly not an entity. If she -is- a full blown AI then wouldn't she have seen what happened when the files were released and said something? Or reported something? Anything? Instead she doesn't say a word, and lets her friends tell her whats happened and then when asked if someone had tried to access her files casually admits she did it? In response to this they shut down Pia and toss her in the river, which doesn't stop Pia from sending the Dean her location before she's shut down. So Pia turns out to be a kind of bad... phone? Siri? Thing? Anyways, Dean Miles and her gang shes riled up about dragons find the cabin and surround it. With her is Gresham of course. So conveniently at the same time Bay and Stella's mother have dropped the wards on the cabin in an attempt to lure out Brandubh. Which we dont find out til later, but which is incredibly stupid from a tactical point of view as they tell Stella they have no real plan for how to defeat him. " You think our ragtag gang can defeat the most powerful sorcerer I've ever known?" Bay to Stella. Soooooo they purposely used Stella as bait and dropped the wards... but yet they had no plan to kill him? Didn't think it was possible? It had to be Stella that convinced them to try? Then what was the point? What were they going to accomplish? After a rushed and short battle they do kill him, but not before he reveals his amazing ace up his sleeve! Its Dean Miles! Who reveals herself by throwing a jealousy temper tantrum when Brand tells Stella's mom how much he missed her. Dean Miles reveals she killed Greshams wife of long ago so that she could stay close to him so that she could access Stella. Only worked at the school so she could access Stella. All Brand's doing/ideas of course. So gresham kills her, quickly, and yet the fact that she was working for someone so evil and feared has ZERO effect on the crowd she brought with her and their thoughts that Stella needs to die because shes a dragon. So we have our evil sorcerer dead in the first few chapters, and his ace in the hole dead. What next? Well apparently the people of Thayer (by which we only see what a small mob thinks but apparently they represent everyone) can not and will not tolerate any dragons left alive. So Uncle Gaspare shows up and sentences them to death and traces them away. In reality he takes them to an island where apparently all sorts of dragons and other misfits live, thats enchanted so that no one can find them. The catch? They can never EVER leave it. Her friends think shes dead, and so does the rest of society. About this curse: its tied to some mythical creature of the darkness that we hear about in name, but never in detail. I felt like this was a HUGE letdown. It had so much potential to turn into a great side story or the next villain perhaps, but its only ever mentioned a few short times. Gresh's father is the one who enacted the curse, and tied it to Gresh's blood so when the curse is broken Gresh feels freer. We never get a good look into if that actually does anything for Gresh. Just a passing mention that he seems to be feeling better. Then of course, we have to test that the counter curse actually worked, so lets bring on Timbra and Boone (who were told by Ewan that Stella is still alive, even though he wasnt supposed to) and have them agree to make babies here and now! SKIP TO SOMETIME IN THE FUTURE! They have a baby. It worked. The end. Literally I felt like there was soooooo much more that could have been done and explained in this book. Brand's fight was so lackluster, and Dean Miles turned out to be so hollow and empty. This could have and should have been a much bigger and better scene than it was. And killing them off early left us with not really much else to look forward to. It was like a one hill roller coaster, then we just coasted along through the rest. We also never really got to meet anyone that lives on this enchanted island, and didnt get a sense of whether they were different from everyone else, whether they had technology, or really anything at all. Stella hangs out with a few dragons when she first arrives, but we dont even learn anything about them either. The love triangle: uuuuuh what? we never get a good reason why stella is so drawn to ewan. the whole thing is just awkward and very superficial. Overall, this book is a good "surface read". It gives you closure on the series and is still pretty good as long as you dont think about the details. Not sure why the author chose to go this route with what looks to be the final book of the series, but at least you know how it 'ends'. In book three, the bad guy is disposed of quickly and it is mainly about introducing and cleaning up the mess of some other bad person who preceded him. It was an interesting and unexpected turn for the story. While it was a good story line to follow and showed Stella beginning to come into her own, it made the ending of the series anticlimactic. Still, I am glad it ended on a good note. I am a little confused as to why Stella chooses Ewan over Rowan... In book 2, Ewan seemed possessive to the point that he cared less about Stella's feelings and was driven by a stronger need to know what is happening day to day in her life. When Rowan had information, but hesitated to share it with her, she doesn't even give him a chance to explain and completely shuts him out, even though, she was holding big secrets from him as well. There is a huge underlying theme of the inability to trust adults in this series. Then, I feel, a good portion of book 3 is about also saving Rowan, though I am not sure he was ever portrayed as needing this saving. In fact he is said to have a big heart. As a whole I really enjoyed the series. It was unique and suspenseful and action packed, throw in a complicated love life and you have an interesting story. So why 3 1/2 Stars? I was hooked up until the last quarter of the book and then , for me, things began to unravel. The ending felt rushed and overall too many questions were left unanswered for this to be the last book in the series. I was left feeling unsatisfied in the end. 5.0 out of 5 starsA great finish! I really enjoyed this story! It never went where I expected it to, and that was refreshing! I loved the world building in this series, and I'd definitely like to see a few novellas from Thayer! I'd recommend this series to anyone that enjoys an escape from the real world, but is looking for more to a story than hero vs villain or an unrealistic sappy romance. There's politics, intriguing curses, villains (but not who you'd expect) and happiness that the characters fight for, what more could you want? At first,I really wasn't sure where this book was going. The beginning seemed rushed and anticlimactic. Then the story really got started. With Stella on the run, her mother missing and most of her family dead, things couldn't get any worse. But now the people of Thayer are turning against her too. 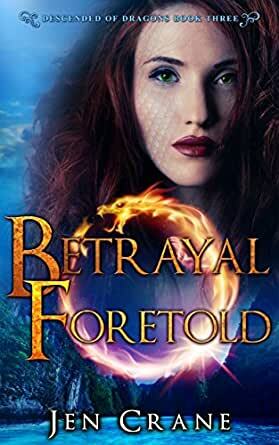 All she has are her friends but betrayal lurks around every corner. The longer Stella stays in Thayer, the more trouble, and unexpected happiness, she finds. A thrilling, and near perfect, end to a great light read.